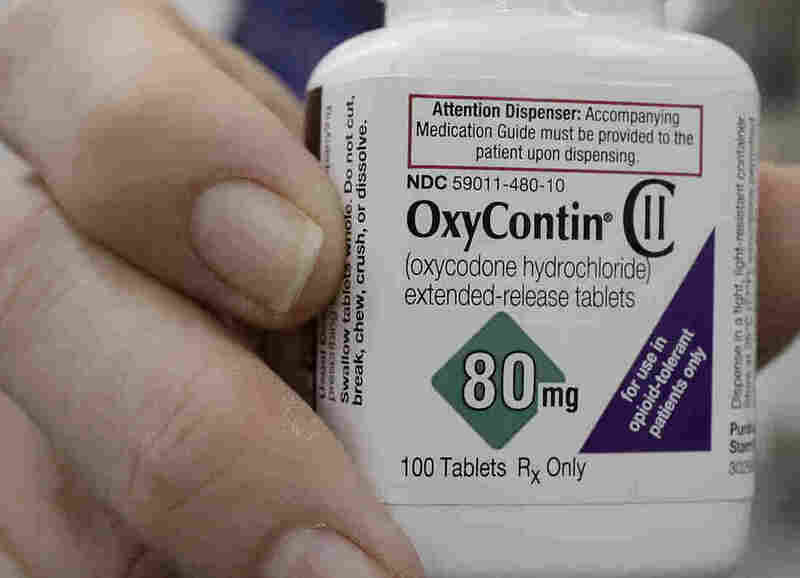 Massachusetts Sues OxyContin Maker Purdue Pharma, Saying It 'Peddled Falsehoods' The civil lawsuit is just one of many the opioid drug manufacturer now faces — but the complaint filed Tuesday adds an unusual wrinkle: It also singles out the Sackler family, which owns Purdue. A pharmacist holds a bottle of OxyContin earlier this year at Daniel's Pharmacy in San Francisco. The state of Massachusetts is taking a new step in the fight against the opioid epidemic, filing a lawsuit against Purdue Pharma that also names the OxyContin maker's executives. The suit alleges the company and 16 of its current and former directors misled doctors and patients about the risks of its opioid-based pain medications. "Their strategy was simple: The more drugs they sold, the more money they made — and the more people died," the state's attorney general, Maura Healey, said at a news conference on Tuesday, flanked by Gov. Charlie Baker and law enforcement officials. "We found that Purdue engaged in a multibillion-dollar enterprise to mislead us about their drugs," she added. "Purdue pushed prescribers to give higher doses to keep patients on drugs for longer periods of time, without regard to the very real risks of addiction, overdose and death." Across nearly 80 pages, the civil suit filed in Suffolk Superior Court lists Purdue's alleged wrongdoing and its effects on people in Massachusetts in painstaking detail. Citing the Massachusetts Department of Public Health, the complaint notes that more than 11,000 of the state's residents have died of opioid-related overdoses in the past decade — nearly 2,000 of whom died last year alone. Of the deceased, the complaint says at least 671 people had filled prescriptions for Purdue's opioid drugs. "All the while," Healey's complaint adds, "Purdue peddled falsehoods to keep patients away from safer alternatives. Even when Purdue knew people were addicted and dying, Purdue treated the patients and their doctors as 'targets' to sell more drugs." At least half of the suit's defendants are members of the multibillionaire Sackler family, which privately owns the OxyContin manufacturer. Reuters reports that with the filing, Massachusetts "became the first state to sue the drugmaker's executives and directors to hold them responsible as well." Back in 2016, Forbes estimated the Sackler family's worth at roughly $13 billion, helped in large part by the massive sales of its company's marquee drug. The new legal complaint estimates that the 671 deaths that Massachusetts connects to Purdue cost the state more than $6 billion. The pharmaceutical company is denying the lawsuit's allegations. "We share the Attorney General's concern about the opioid crisis. We are disappointed, however, that in the midst of good faith negotiations with many states, the Commonwealth has decided to pursue a costly and protracted litigation process," Purdue Pharma said in a statement. "We will continue to work collaboratively with the states toward bringing meaningful solutions." Earlier this year, the company ceased promoting OxyContin to doctors, saying it was following through on a vow it made in an open letter published in December, in which it said, "This is our fight, too." But those announcements have done little to placate state officials, many of whom have taken aim at the company, accusing it of playing a key role in the opioid epidemic. In Boston, member station WBUR reports that hundreds of cities and countries have sued Purdue, in addition to the two dozen states — from Ohio to Alabama -- that have recently filed suits of their own. "By the mid-2000s, there was simply no debate about whether or not these pills were causing chaos, heartache and death across the Commonwealth and across the United States," Gov. Baker said at the news conference Tuesday. "You would think that at some point in time, the people who were at the heart of this would realize the pain and the agony that they had created and step back," he added. "They chose to do just the opposite and doubled down."